Mr Blair, a Catholic convert, said faith was a force for good and it was "futile" to attempt to drive it out. But Mr Hitchens, who is terminally ill with cancer, argued religion forced people into doing terrible things. In a vote after the debate, the audience voted two-to-one in Mr Hitchens' favour. A 23-country poll paid for by the debate's Canadian organisers suggests the world is evenly split on the issue. The confrontation took place in front of a sell-out audience of 2,700 people in Toronto's Roy Thomson Hall. The two men were asked to debate the motion: "That religion is a force for good in the world". The BBC's Paul Adams, who was in the hall, said it was a carefully moderated and largely polite debate, without the rumbles of thunder many had been hoping for. Regarded as a leader of the "New Atheism"
Mr Blair, a lifelong Christian who converted to Catholicism after leaving office in 2007, acknowledged that "horrific acts" had been committed in the name of religion. But he said that a "world without faith would be morally diminished". He said the most challenging issue for people of faith was how to explain the relevance of ancient scripture in the modern world. Mr Blair also insisted that his decision to support the US invasion of Iraq was based on policy and not on his faith. Mr Hitchens, who has previously described Christianity, Judaism and Islam as the "real axis of evil", said religion was "a cruel experiment whereby we are created sick and ordered to be well". Humans gained little, and compromised their freedom, by acting like sheep, said Mr Hitchens. He said religions created a "celestial dictatorship" which was "greedy for praise from dawn to dusk". He won a laugh from the audience and Mr Blair when he compared such an authority to the North Korean leadership. In the end, the audience seemed more impressed, and perhaps more entertained, by Mr Hitchens, says our correspondent, and he won the debate by a margin of two to one. Prior to the debate, the organisers had commisioned a 23-country poll on religion by Ipsos. Anyone expecting verbal pugilism, or a blood-soaked gladitorial contest, with Tony Blair as the Christian thrown to the hungry atheist lion, might have walked out into Toronto's chilly night a little disappointed. 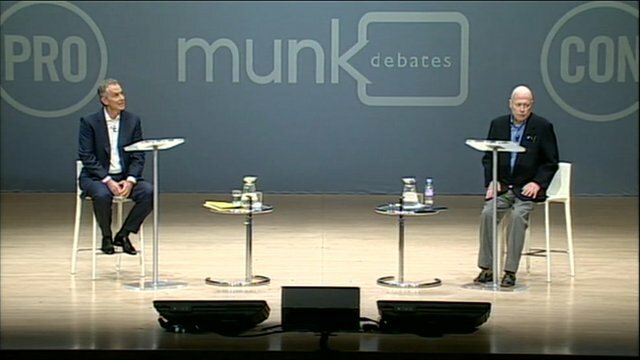 It's not that the two men didn't debate with conviction, but the format engendered politeness - this is Canada, after all- and somewhat stifled argument. And perhaps the lion is wounded. Mr Hitchens is starting to look frail, in the throes of a cancer that he acknowledges will probably kill him. Tony Blair, by contrast, looks a picture of well-dressed health. When asked which of each other's arguments they found convincing, both men were polite, respectful. Tony Blair admitted that it wasn't always easy for people of faith to explain the importance of scripture in the modern world. Mr Hitchens admitted no such intellectual difficulties, saying he preferred the awe-inspiring wonders of the cosmos to what he sees as the destructive teachings of organised religion. An audience of 2,700 sat in rapt attention, frequently applauding both men. But a random sample afterwards tended to tell a consistent story. People weren't necessarily opposed to Mr Blair's argument, but they found Mr Hitchens the more persuasive speaker. Some 48% of the 18,192 people questioned by Ipsos took the view that "religion provides the common values and ethical foundations that diverse societies need to the thrive in the 21st Century". Fractionally more - 52% - supported the view that "religious beliefs promote intolerance, exacerbate ethnic divisions, and impede social progress in developing and developed nations alike". Rich countries were less likely to see religion as a force for good than poor countries - the main exception being the United States, where 65% said it had a positive impact. The Ipsos poll, conducted in September, found that Europe was the region most doubtful about the benefits of religion, with just 19% in Sweden agreeing that it was a force for good. At the other end of the scale, in Saudi Arabia and Indonesia, it was seen as a positive force by more than 90% of those questioned. Within North America, there was a pronounced divide. In Canada, only 36% agreed with the positive view of religion whereas 64% saw it as a negative force - figures almost exactly the reverse of those in the US. Christopher Hitchens has continued his outspoken attacks on religion in interviews as he is treated for cancer of the oesophagus. He is scathing about those who suggest his illness might lead him to retract his atheism. In a BBC Newsnight interview to be broadcast on 29 November, he says he is not afraid of death, but regrets the fact that it will cause distress to friends and family. 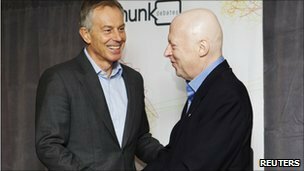 In comments released by the debate's organisers he said it was "bizarre" that Mr Blair, a Catholic since 2007, had converted "at one of the most conservative times for the Catholic Church, under one of the most conservative popes". Speaking before the debate, Tony Blair said: "The good that people of faith all over the world do every day, motivated by their religion, cannot be underestimated and should never be ignored." It could, and should, be a force for progress, he said. This is what I am talking about - it is not a question of religion, it is a question of faith. We all have faith in something and there is no need to build churches and clans in the name of it. Thank you for sharing this post. I appreciate it.